Our ID specialists' will help you to make sure photos for your passport, driving licence or visa meet all the regulations - your application might be delayed otherwise. Call in to see the team at 18 Thayer Street London W1U 3JY today where we can take visa and passport photos for any country. 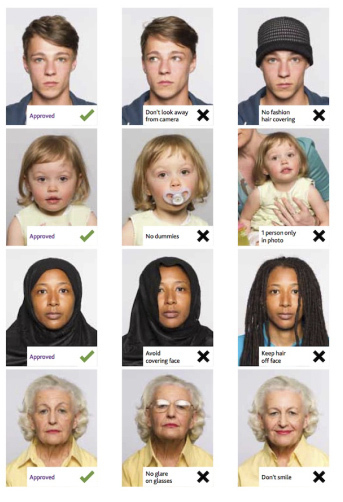 Whether you need your passport photos printed or in digital format we can help you. For British passports your photos must be 45mm high by 35mm wide and we can save them onto a USB or email them to you. We will ensure that you get the right size. Please note: you cannot use photos that have been cut down from larger pictures. Your photos must show a close-up of your full head and shoulders. It must be only of you with no other objects or people. 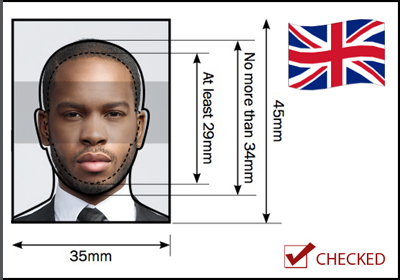 The image of you - from the crown of your head to your chin - must be between 29mm and 34mm high.